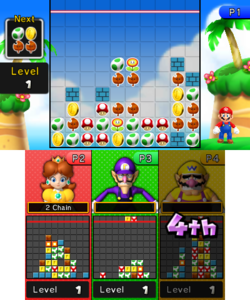 Three House (Fall Into Line in the British English version) is a puzzle minigame in Mario Party: Island Tour. The American English name is a play on "tree house". The player will have to match three or more pictures of Mario items in a line to clear. If the player gets a large enough score, the level will increase. There are six different Mario items, which are a Super Mushroom, a Coin, a Super Leaf, a Yoshi Egg, a Fire Flower, and a Ice Flower. A POW Block might appear after clearing many items. Single player: "Line up three of the same item, either vertically, horizontally or diagonally, and they will vanish. Use POW items to make all of one kind of item vanish." Multiplayer: "Line up three of the same item, either vertically, horizontally or diagonally, and they will vanish. Clear a lot of items simultaneously to send a Brick Block to rival boards. Clear Brick Blocks by clearing items adjacent to them. Use POW items to make all of one kind of item vanish."